"The rebellion to restore the throne of David on earth." 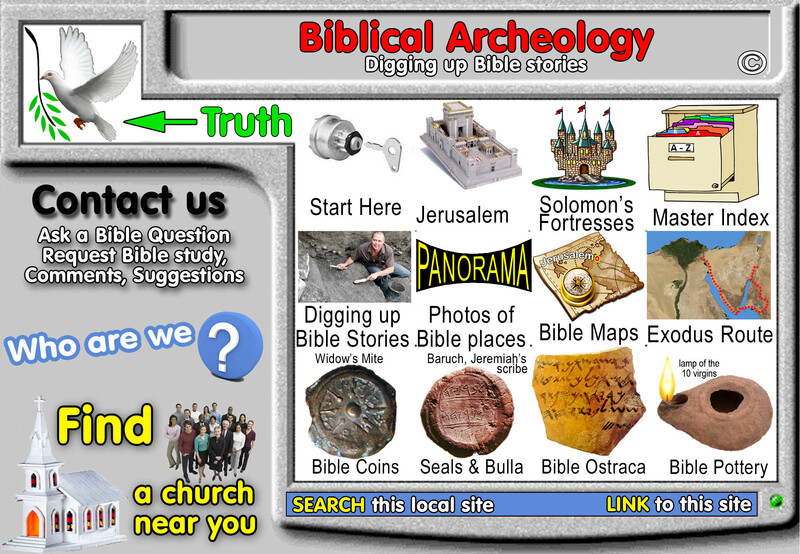 "Archaeologists are digging up bible stories!!!" 2. Inscription: "Belonging to Gedaliah who is over the house"
7. Events: Gedaliah, 1st Judean governor appointed by Nebuchadnezzar in 587 BC, assassinated by Ishmael and Baalis. Archaeologists are digging up bible stories!!! 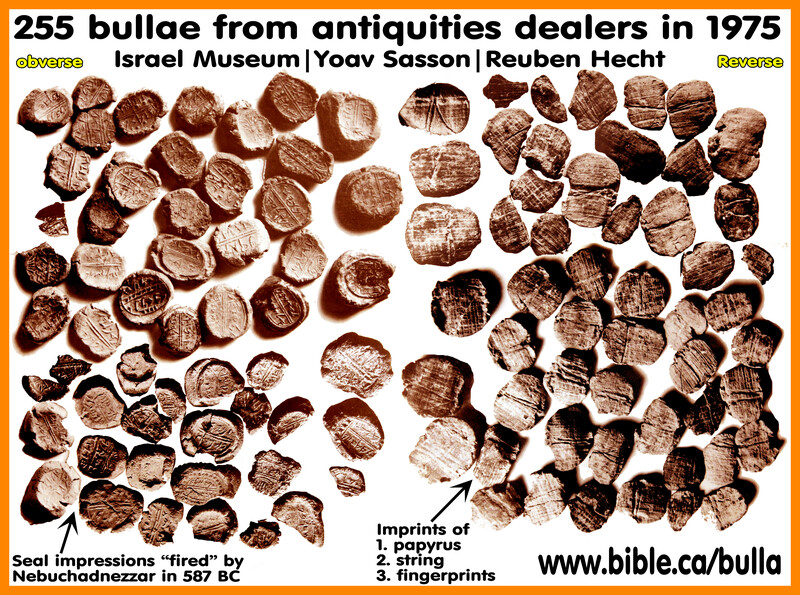 Archaeology is an important science that confirms the historical accuracy of the Bible. Since the Bible refers to hundreds of cities, kings, and places, we would expect to find evidence from on-site excavations. And this is exactly what we have found. The Bible is the most historically accurate book of history on earth. Read the Bible daily! 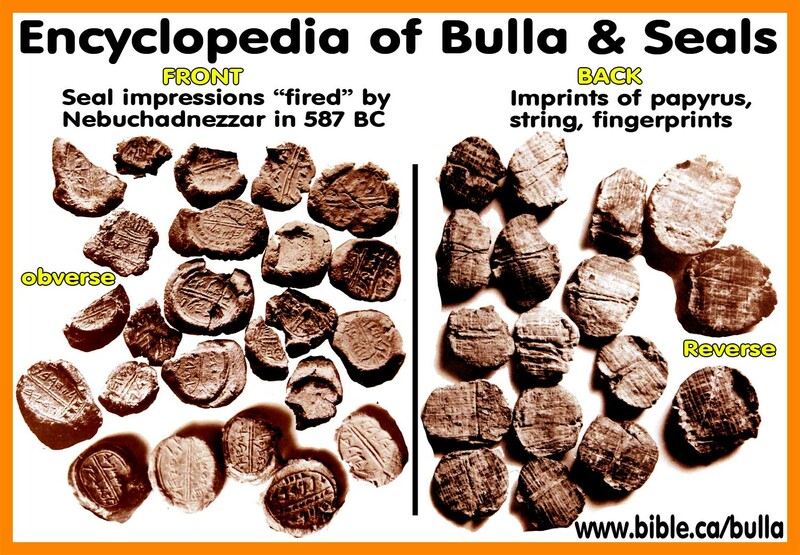 Bulla "belonging to Gedaliah who is over the house"
7. Events: Gedaliah, 1st Judean governor appointed by Nebuchadnezzar in 587 BC, assassinated by Ishmael and Baalis helped by Jaazaniah and Maimen. Don't call God a Liar! Jeremiah was born around the same year as Josiah in 648 BC. He started preaching at age 19 when Josiah began purging the idols from the land. He wrote the books of Kings and Jeremiah. 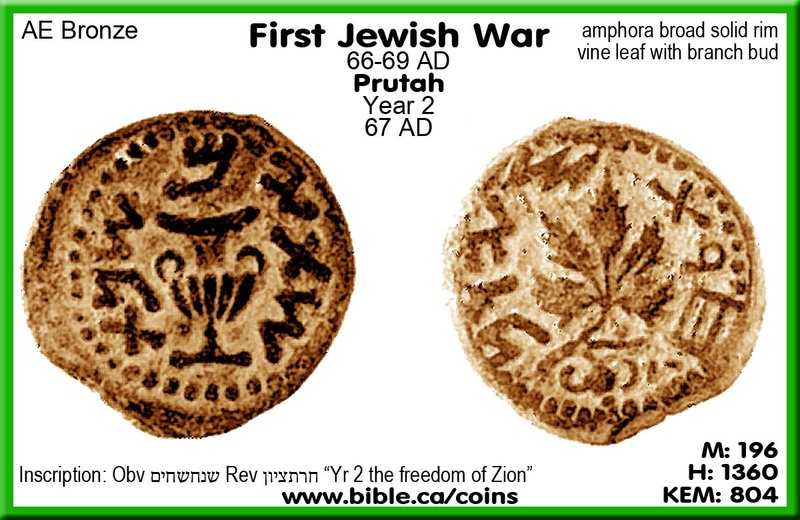 His ministry lasted until 561 BC when he recorded the rations given to Coniah by the new King of Babylon Evil-merodach. 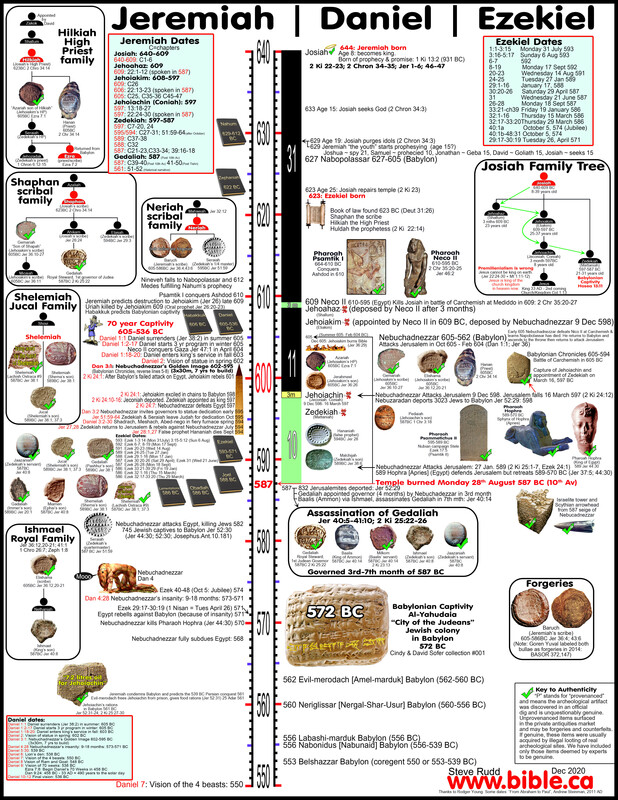 The chronology of the book of Jeremiah is confusing and needs the index we supplied on the "timeline of Jeremiah" chart above in the little call out box. A member of an important scribal family and the first governor of Judea appointed by Nebuchadnezzar for 3 months in 587 BC: 9 Tammuz-Tishri (July - September) until he was assassinated by Ishmael, the son of David in cooperation with Baalis king of Ammon. King of Babylon whom God called, "My servant" who burned Jerusalem and deported the Jews to Babylon for 70 years. Nebuchadnezzar's army commander for the entire operation to burn Jerusalem and destroy the temple. 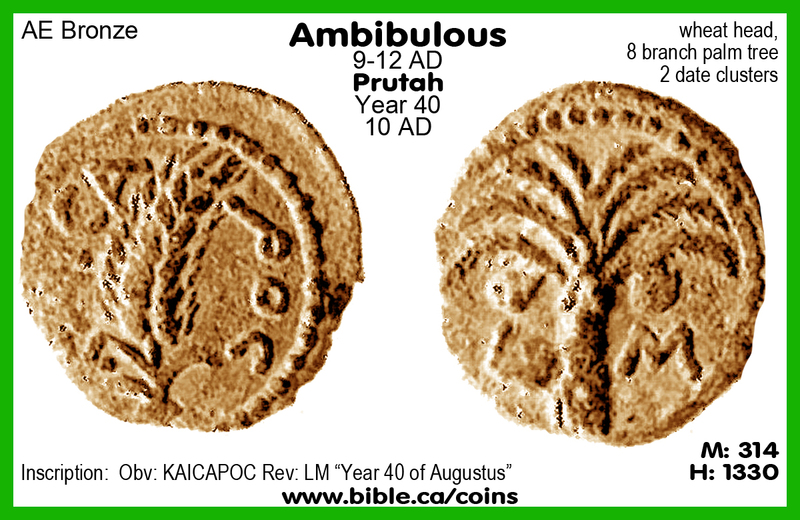 King of Ammon with capital city at Rabbah (Modern Ammon, Jordan) was the master mind behind the murder of Gedaliah who offered to support Ishmael as the new king of Judah in exchange for Jewish slaves. He hid from the Babylonians instead of surrendering to them. He led the people to Egypt rather than stay in Judah. This group of faithless idol worshippers also disobeyed Jeremiah like Johanan by fleeing to Ammon, Moab and Edom instead of surrendering. They also move to Egypt. These are the cream of the spiritual crop, the first fruits of the age, the faithful worshippers of YHWH who believed the message of the Bible and the prophets to surrender to the Babylonians. They surrendered early in 605 BC along with Daniel, Shadrach, Meshach, Abed-nego. It took great faith to give up all your earthly belongings and your life as you know it and to walk away from it all with the cloths on your back to start a new life from scratch in Babylon for 70 years. 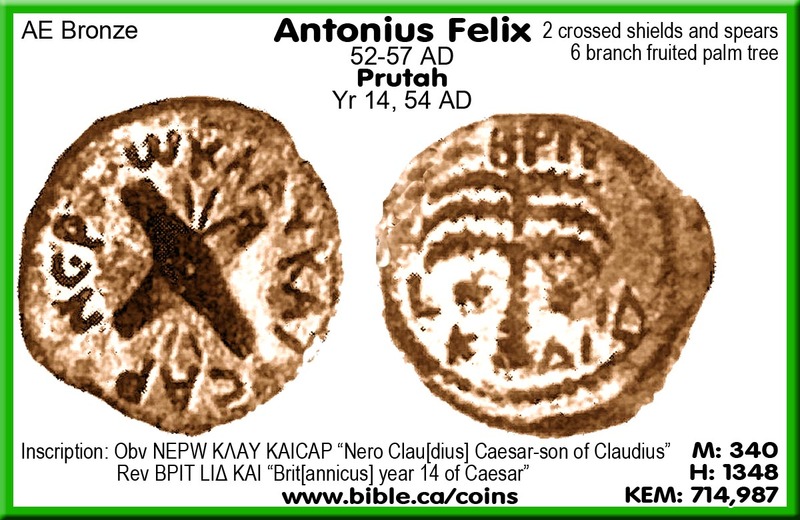 This is the king of Egypt to promised military help to Zedekiah but retreated. Zedekiah has relied on him instead of God to repel Babylonians. 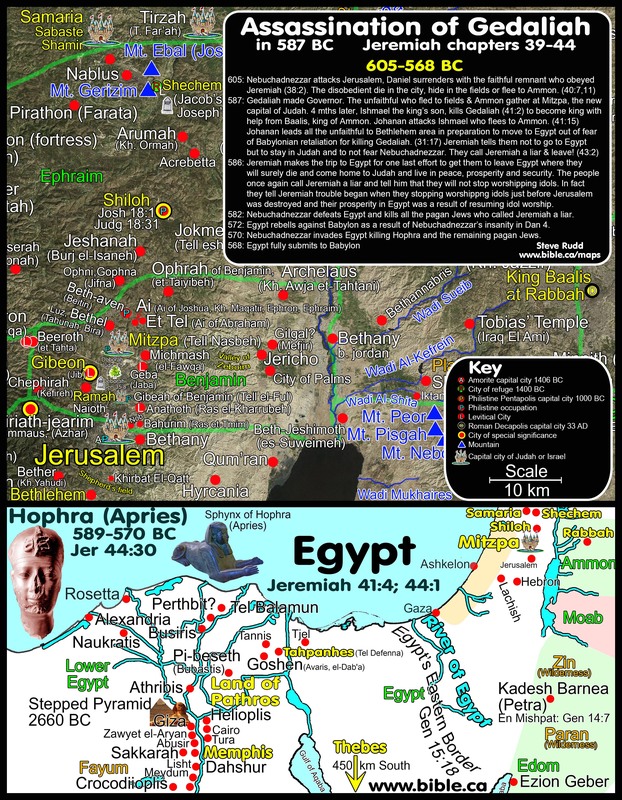 When the Jews migrated against the wishes of Jeremiah to Egypt, they were under the control of Hophra. In 582 Nebuchadnezzar defeats Hophra and kills the pagan Jews living in Egypt. Hophra rebelled against Babylon in 571 because of the 6-18 months (~573-571 BC) of insanity of Nebuchadnezzar in Daniel 4. 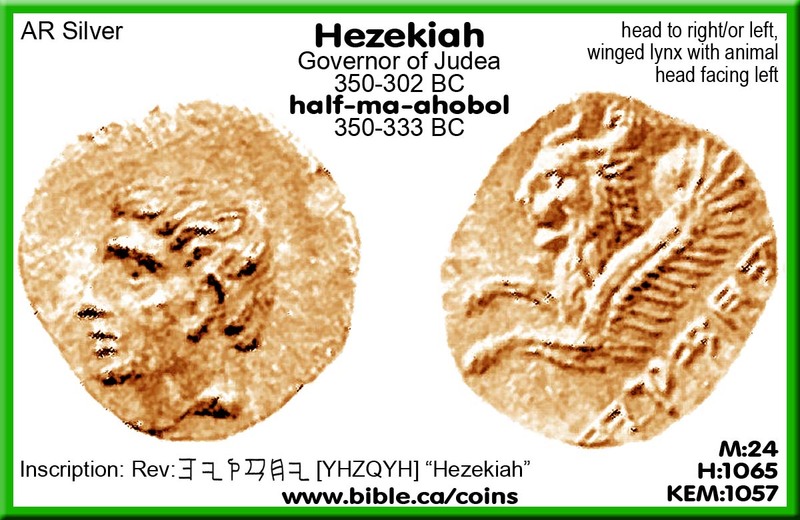 In 570 BC Nebuchadnezzar kills Hophra fulfilling the prophecy of Jeremiah. The story of the assassination of Gedaliah is the final act of rebellion by faithless, self-seeking, worldly ambitious, pagan, idol worshipping and disobedient Jews. God had willed that the throne of David had become forever extinct on earth and having Gedaliah, a mere scribe as king, was quite a shock to Ishmael, a direct descendant of David and Bathsheba and living heir to the throne… or so he though. This shock, indignation, lack of faith and personal ambition led Ishmael, "the king's son" to rise up and kill Gedaliah, the Lord's anointed. Jeremiah had instructed the faithful Jews to surrender to Nebuchadnezzar in each of his three attacks on Jerusalem (605, 597, 587 BC). Those who left were the "cream of the spiritual crop" and became the pure remnant of Israel who returned to Judea until the coming of Christ. Those who disobeyed Jeremiah's call to surrender to Nebuchadnezzar by staying in Jerusalem, hiding in the fields or seeking refuge in Ammon, Moab or Edom were killed. 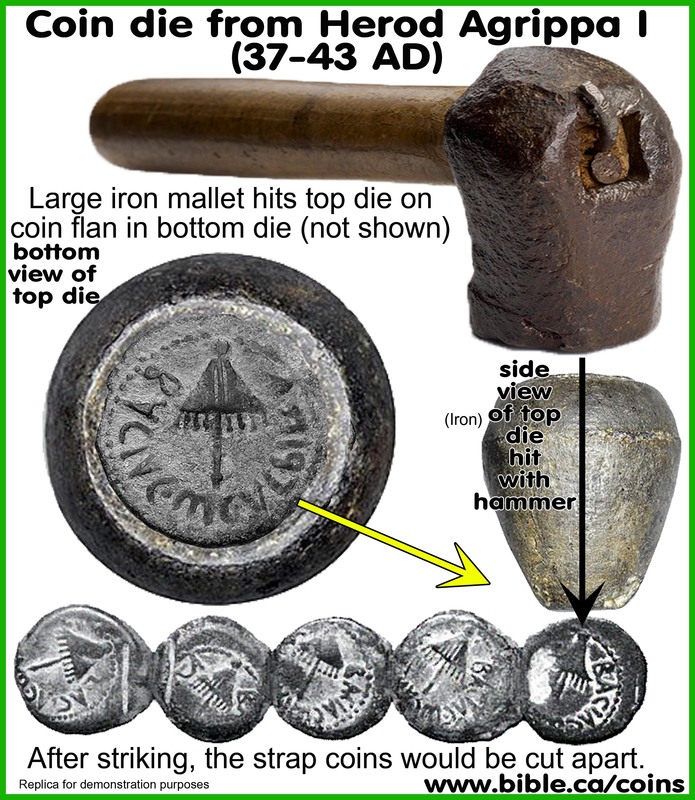 Archeology has uncovered six different bulla and seals of men involved in the assassination of Gedaliah! This is an excellent example of how archeology verifies in the ground what we read in the book. 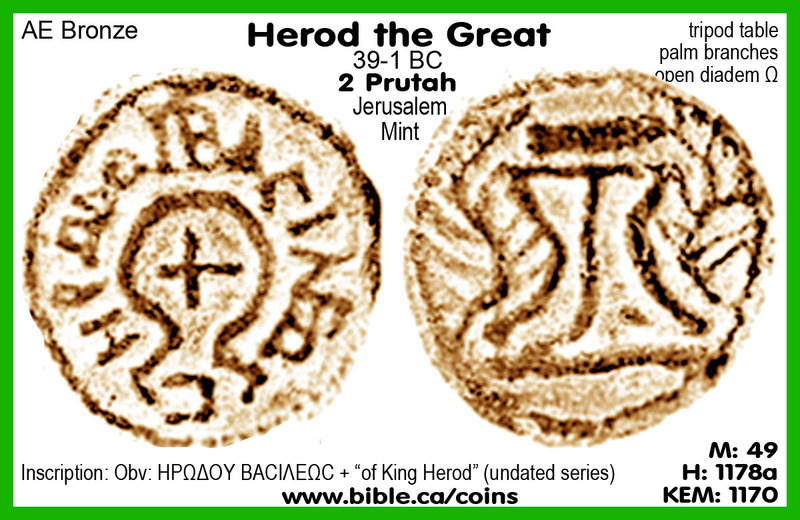 We have found six seals and Bullae of 6 different men involved in the story of the assassination of Gedaliah from a single Bible text. Nebuchadnezzar appointed Gedaliah the first governor of Judah after Zedekiah was deported to Babylon. When Nebuchadnezzar deported Zedekiah in 587 BC he appointed this Gedaliah to be governor of Judah. 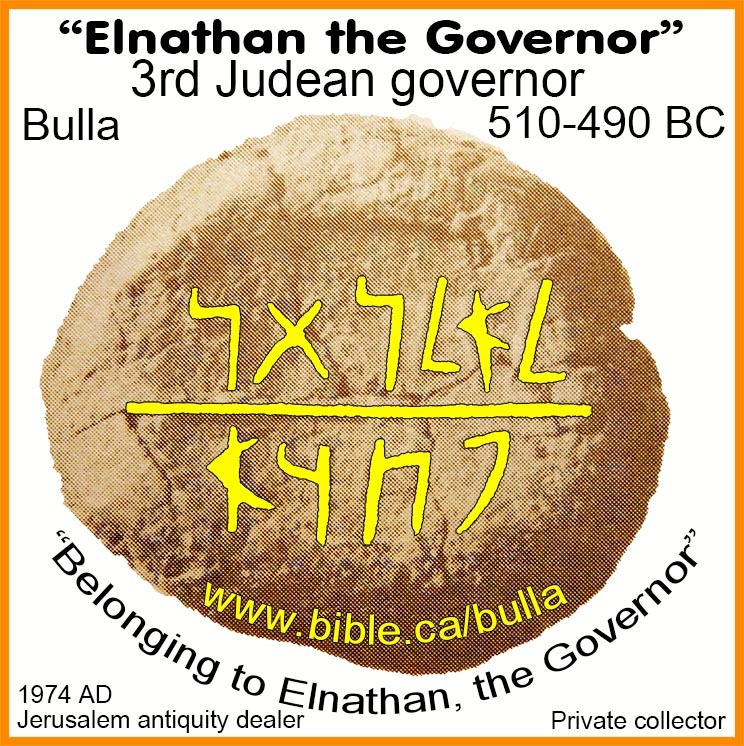 For example Elnathan is the third "Persian" governor of Judah. 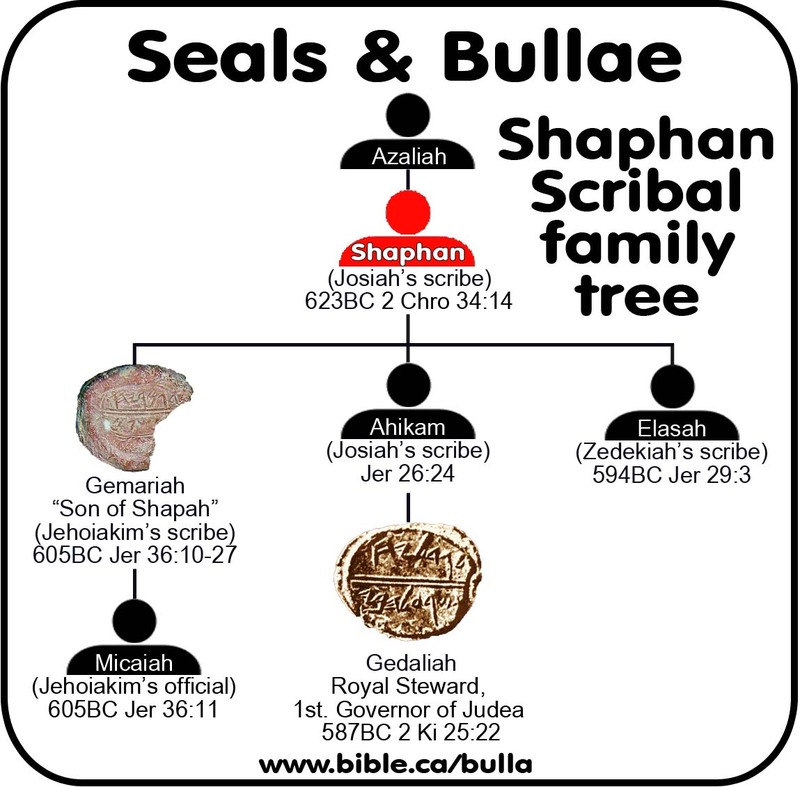 Gedaliah was a member of the Shephan scribal family. Gedaliah was the son of Ahikam, (who was an important advisor to King Josiah: 2 Kgs 22:12, 14; 2 Chr 34:20) and the grandson of Shaphan. Gedaliah's father (Ahikam) and grandfather (Shaphan) were directly involved in the story of the lost book of the Law found under Josiah in 623 BC. It was Shaphan (a scribe) who first read the law and reported its contents. 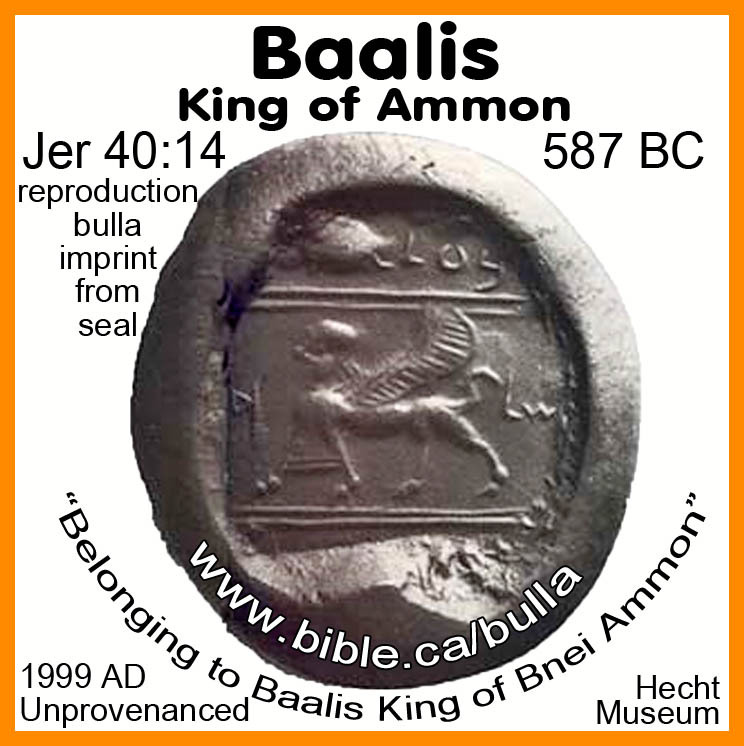 Baalis king of Ammon hired Ishmael from the royal family of David to assassinate Gedaliah. Gedaliah's death was commemorated as the “fast of Gedaliah,” on the seventh month (Zech 7:5; 8:19) but today the third day of Tishri (September). To this day, the Jews celebrate a fast in honor of the murder of Gedaliah on the third of Tishri, even though it was originally in the seventh month (Zechariah 7:3; 8:19). 605 BC deportation: Small "cream of the crop" remnant of high faith: the first fruits. Daniel surrenders to the Babylonians in keeping with the instructions of Jeremiah while Ismael had fled to Ammon to seek refuge from Baalis, king of Ammon and the army had hid in the hills, fields and caves. The numbers are not given, but it would be a small number that included Daniel, Shadrach, Meshach, Abed-nego. It took a huge amount of faith to leave Jerusalem and surrender at the first appearance of Nebuchadnezzar in 605 BC. 601 BC Jehoiakim rebels after Nebuchadnezzar is repelled by the king of Egypt. 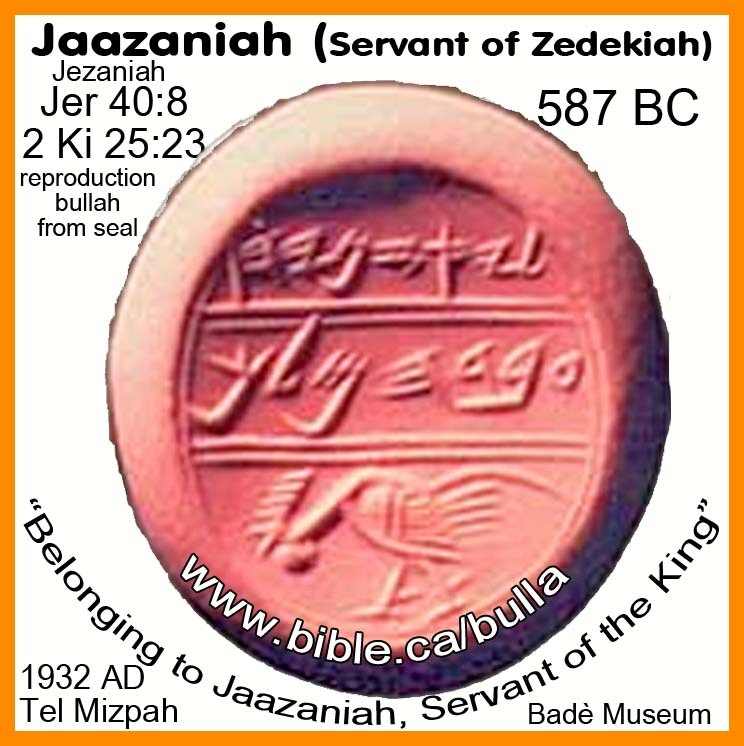 In 609 BC Jehoiakim was initially appointed by Neco II, king of Egypt but when Nebuchadnezzar defeated Neco II in the battle of Carchemish in 605 BC, Jehoiakim was forced to submit to Babylon. In 601 BC, Nebuchadnezzar launches an attack on Egypt which failed and had to retreat. This military failure Nebuchadnezzar emboldened Jehoiakim to rebel against Babylon with the expectation of assistance of some kind from Egypt. Egypt never did help Jehoiakim and he was led away in chains to Babylon where he died. "Late in his fourth year (601/600 b.c.) he marched against the borders of Egypt but was met with a serious setback and consequently spent his fifth year recuperating and refitting his army. In 599/598 b.c., in the ninth month (Kislev), he again moved west and plundered several Arab towns to the east of Palestine. The following year he attacked Palestine, again in the ninth month. The account offers very specific details of his capture of Jerusalem on the second day of Adar (the twelfth month), i.e., February 16, 597 b.c." (WBC, 2 Kings 24:1-20, p348, 1998 AD). 597 BC Deportation: 10,000 Jews. When Jehoiakim was captured, put in chains and deported to Babylon, his son 8 year old Jehoiachin became king. Such a young king was unacceptable to Nebuchadnezzar so he ordered him to surrender. Jehoiachin is the only king during the life of Jeremiah who actually did what the prophet said: Submit and Surrender. This was a major deportation designed to weaken the Jewish state. All the men of war, the tradesmen, the leaders and army commanders etc. Clearly at this time some of them fled to Ammon and hid in the fields and hills. 587 BC Deportation and destruction of the temple of Solomon: only 832 people. What is stunning about this tiny number is the fact that the entire city was destroyed. The 832 must have surrendered immediately but for the 300,000 living in the city it was death! God's grace had come to an end. Repeated warnings to repent or surrender had been ignored. When God's wrath destroyed His holy temple, the people paid with their lives and blood. Judah had governors appointed under the occupation of Babylon, Persia, Greece and Rome right down to the destruction of Jerusalem in 70 AD. Their sin and disobedience and idolatry caused them to lose all their autonomy. In the same way we become slaves to the devil when we sin. Gedaliah commanded the people to submit to the Babylonians without any fear, settle down in Judah and carry on their normal lives. THE DEAL: If Ishmael delivers Baalis Jewish slaves then Baalis will support Ishmael's bid to be king! Remember that a large group of Jews had been living in the kingdom of Ammon (Rabbah, modern Ammon, Jordan) for up to 18 years and they were probably very useful and productive members of society, as we see Jews today are very productive in all areas of life! This productive and resourceful group left Ammon and returned home to Jerusalem WITH Ishmael. We know, therefore that the deal between Baalis and Ishmael had been made before these Jews began their journey from Ammon to be repatriated with Judah across the Jordan River. Jerusalem is only 75 km from Ammon. A one or two day journey. Meanwhile, another group of Jews had disobeyed Jeremiah's order to surrender to the Babylonians who had hid in caves in the hills and fields, came out of their hiding places and joined Gedaliah at Mitzpa. Johanan the son of Kareah was the commander of the Jewish army at the time of Zedekiah's deportation. He and a battalion of soldiers had successfully escaped capture or detection by the Babylonians. This second group of faithless disobedient Jews had their eye on gaining power in the vacuum left by the departing Babylonian army. While it was Johanan the son of Kareah, who warned Gedaliah about the assignation plot, as we will see later, he was an evil man who led a large group to their destruction in Egypt after Jeremiah specifically forbad them under the command of God himself. 587 BC, 7th month: Ishmael and ten men kill Gedaliah who had governed for only 3 months. After Ishmael had killed Gedaliah, he rounded up all the people he could and prepared to deport them back to the king of Ammon likely to be sold a slaves… until they were stopped by the commander of the Jewish army arrived. 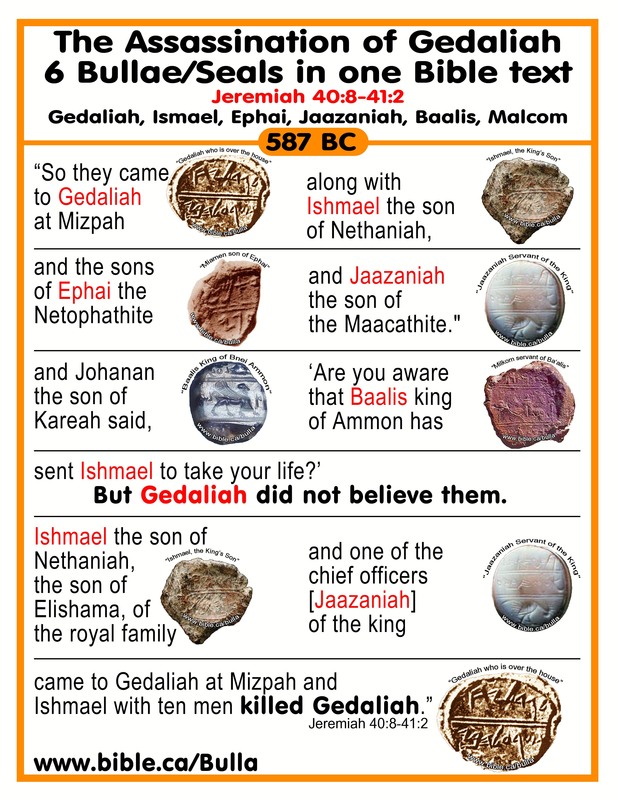 Notice again that Ishmael was bringing back anybody he could "kidnap", including those whom Nebuchadnezzar had left under Gedaliah's control. Thus the deal was for Ishmael to deliver a large slave population to Ammon and in return Baalis would support Ishmael's bid to become king of Judah. The slaves would include those who had returned from Ammon with Ishmael (and act of betrayal) and those who had stayed in Judah and never left. 587 BC, fall: The great escape: Ishmael flees back to Ammon and Jonanan flees to Egypt after rescuing the people from Ishmael out of fear of Babylonian retaliation. Johanan, army general, asks Jeremiah to seek advice from God and after 10 days God answers: DO NOT GO TO EGYPT. Johanan, had already disobeyed Jeremiah once when they hid from the Babylonians instead of surrendering to them. Now Johanan will disobey Jeremiah a second time when he is commanded to stay in Judah without fear of the Babylonians and not flee to Egypt. Those who replied included Johanan, the very army commanded who first warned Gedaliah about the threat to his life, then defeated Ishmael and recaptured the hostages, then lead the entire group to Bethlehem as a staging ground to make the migration to Egypt. The faithful, "obedient to the prophet", righteous seed of Judah had surrendered to Nebuchadnezzar for deportation to Babylon who lived safe and contented and prosperous lives. The idol worshipping faithless rejected the commands of the prophet, calling him a liar and it ended in their death. Those who hid in the Judean fields or fled to Ammon, Moab and Edom instead of "sitting on the 70 year time out bench" in Babylon as God commanded, violated Jeremiah's commands a second time and went to Egypt to die. Shadrach, Meshach, Abed-nego being thrown into the furnace only to be praised by Nebuchadnezzar in the direct presence of Zedekiah. The trip home to Judah to rebuild the city walls and the temple under Ezra, Nehemiah. The amazing story of Esther in 483 BC. The birth, crucifixion and resurrection of Christ! The obedience to God leads to life eternal! Detailed outline on Jesus Christ seated on the throne of David now. 587 BC, third month: God had brought the dynasty of king David to a formal end and in a kind of "replacement theology" scenario where, Gedaliah, son of a scribe was now king and Ishmael, the Royal son of David had been made nothing. 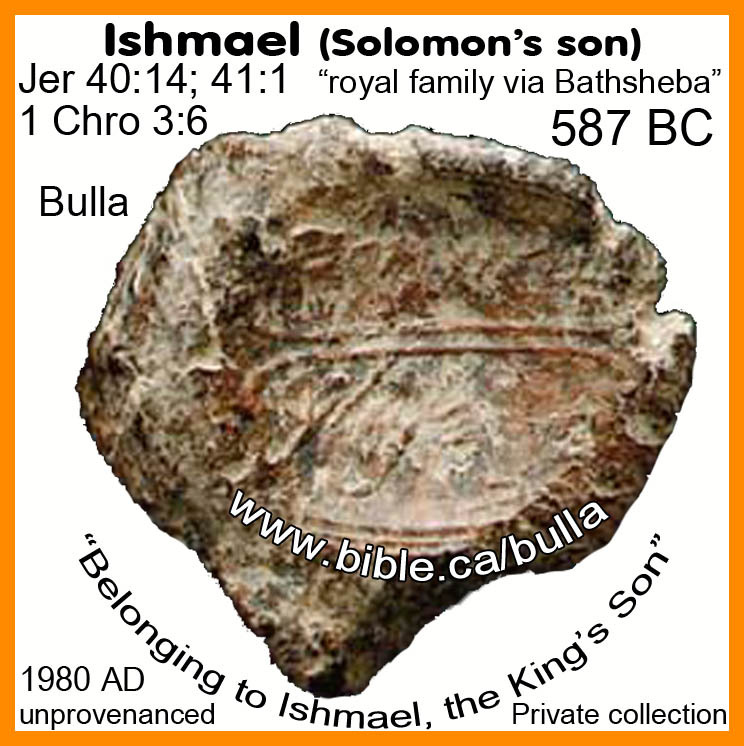 Ishmael was a descendant of David and Bathsheba and part of the ancient Elishama clan of David's sons. Many others had also fled with Ishmael to Ammon to escape the Babylonians. This brought much money and skilled labour to the Ammonite kingdom. 18 years later, when the Babylonians returned home they appointed Gedaliah as the first governor of Judea with essentially same power and authority as the previous kings of Judah. Ishmael, a genuine royal heir to the throne of David, was unhappy and perhaps indignant that Gedaliah a mere scribe, was sitting on David's throne. Jeremiah himself prophesied the extinction of the throne of David on earth regarding King Jehoiachin (Jeconiah, Coniah), Jehoiakim's son, who reigned 3 months in Jerusalem at age 8.
g. Although Josiah had three sons who were kings, Coniah was the end of the dynasty of King David. b. The throne of God was originally in heaven, but during the time of Saul the throne came to earth until the deportation of Jeconiah (Coniah) and Zedekiah. c. Jesus Christ sits on the throne of David right now as king of the universe which he created by the power of his own divine might. 4. Only through Jesus Christ, the branch (seed) of David are the fortunes of David and the throne of David restored IN HEAVEN NOW not on the earth. The Holy Spirit was careful to draw special attention in showing a reverse parallel in the story of Saul unsuccessfully trying to extinct the throne of David in attempting to kill him, and Ishmael the son of David unsuccessfully trying to restore the throne of David in the successful assassination of Gedaliah. The fact there are two whole chapters in Jeremiah about Gedaliah is a signal something greater than insurrection and murder of a governor is in play here. Indeed, the destruction of Jerusalem and the temple and the appointment of Gedaliah was like God dropped a nuclear bomb on the entire nation of Israel and Judah. Within 5 years of 587 BC, the entire promised land lay uninhabited, desolate and destroyed. A brand new world order of perpetual occupation by foreign powers had swept over the Jews which they would have to live with until the coming of Christ. The capital city was moved from Jerusalem to Mitzpa, given the destruction and burning of Jerusalem. 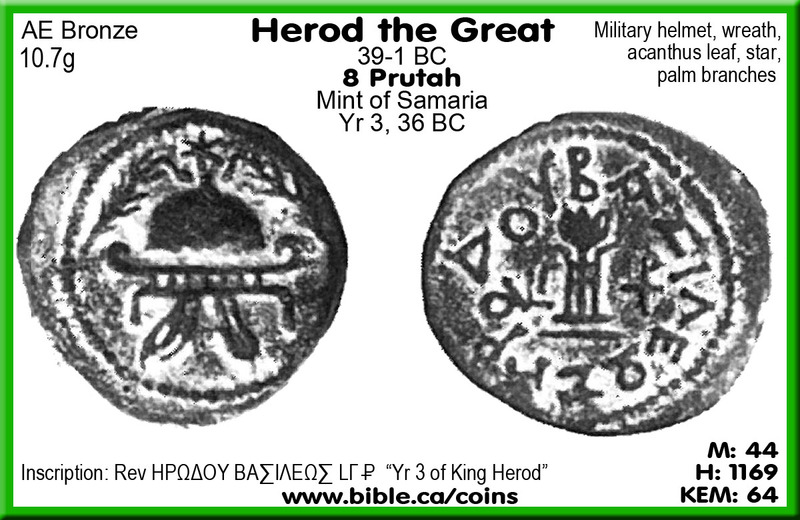 The end of a long established dynasty of father to son kings dating back to 1010 BC when David first ruled from Hebron after the death of Saul and the appointment of a mere scribe, Gedaliah. Both Saul and Gedaliah were confirmed as kings at Mitzpa. Special attention is drawn to the fact that Jehoiakim, Coniah (Jeconiah) and Zedekiah sat "on the throne of David" but that they were going to be exiled to Babylon. God even set up a king of Deut 28 "blessings and curses" in Jer 17:24-27 where they were told "if you obey the throne of David will continue but if you disobey the throne of David will end forever on earth". Three times a pagan foreign king Nebuchadnezzar was called "God's servant" who destroyed the temple of David/Solomon. Gibeon: The final battle to defeat the house of Saul was at the pool of Gibeon who then fled across the Jordan River. (2 Sam 2:13-3:1) The final defeat of the house of David happened at Gibeon when Ishmael fled across the Jordan to Ammon. 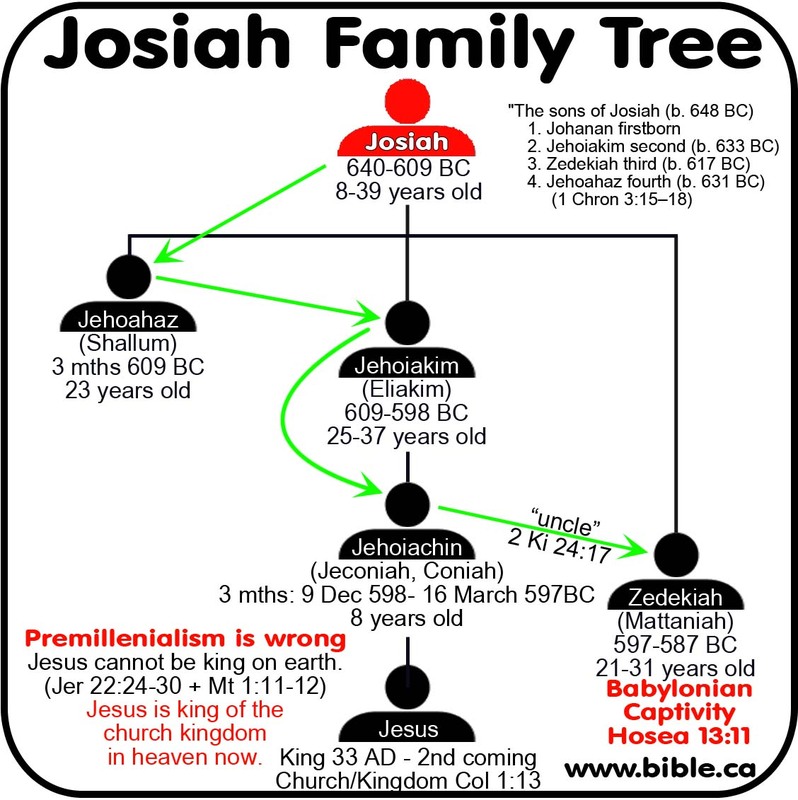 Here is a chart that highlights many of the reverse parallels in the two stories of Saul/David and Ishmael/Gedaliah. 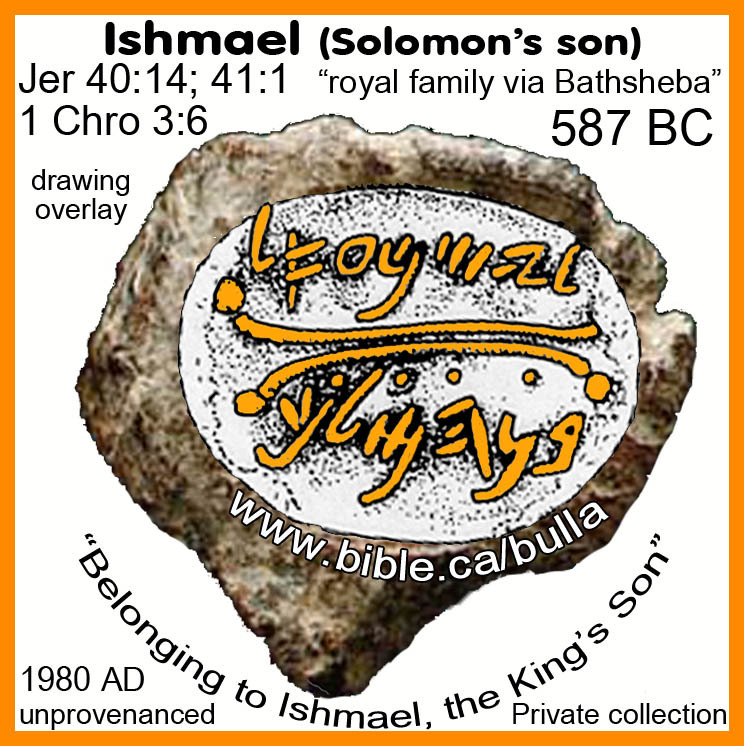 Ishmael was a son of David through Bathsheba and heir to the throne but rejected as king. Gedaliah the "commoner" was a scribe God chose to be king. Ishmael succeeded in killing Gedaliah in a failed attempt to restore the throne of David. David had three chances to kill Saul but would never kill God's anointed. Ishmael killed God's anointed governor Gedaliah. Gedaliah was unwilling to kill Ishmael the son of David (seed anointed) when he was warned of the assassination plot. God called David "My servant, My anointed, My Shepherd"
God called Gedaliah, Nebuchadnezzar and Cyrus called "My servant, My anointed, My Shepherd"
One of David's men offered to kill Saul and david refused. One of Gedaliah's men offered to kill Ishmael but he refused. 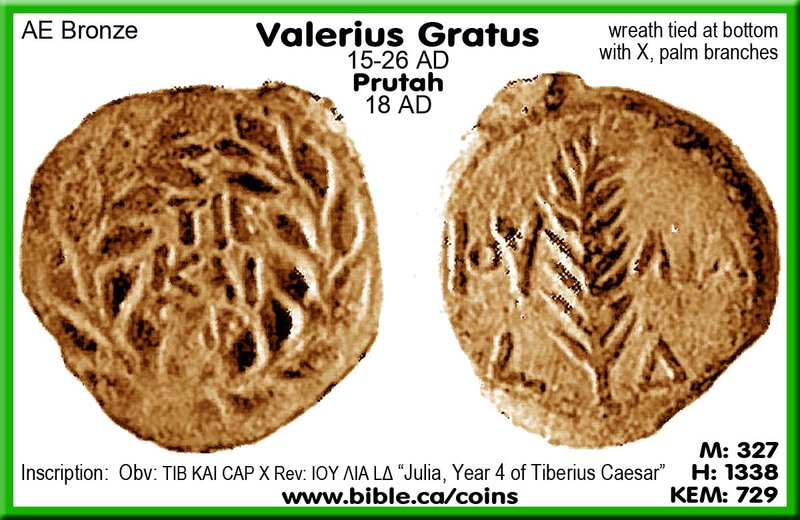 Saul killed 85 tabernacle priests for supporting David in giving him the holy showbread. Ishmael killed 70 worshippers on the way to the house of the Lord to sacrifice for supporting Gedaliah who was used as a lure to their death. Saul lost the war between the "house of Saul" and the "House of David" resulting in the collapse of the house of Saul. Ishmael lost the war to restore the House of David" against the "house of Gedaliah" when he fled back to Ammon in defeat. The final defeat of the house of David happened at Gibeon when Ishmael fled across the Jordan to Ammon. The house of David began in Bethlehem when Samuel anointed him. The house of David ended when Johanan used Bethlehem as the staging ground and last point of departure before moving forever to Egypt. After the period of the kings came to an end, Israel was under foreign control right down to 70 AD with the exception of the brief Hasmonean/Maccabean rule (166-37 AD). Gedaliah was the first post 597 BC Governor in a long line of governors of Judah that date down to 70 AD. 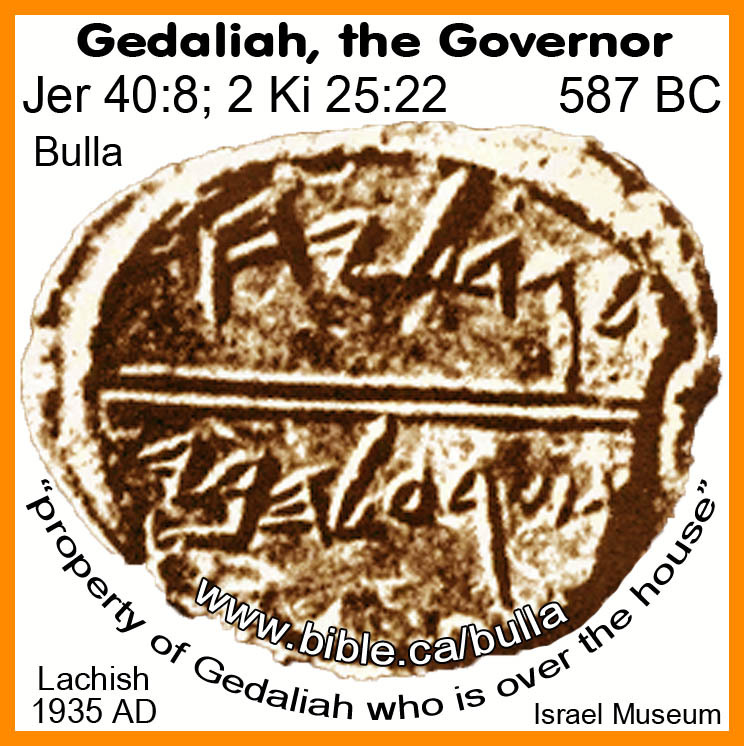 Gedaliah is the only governor of Judea we know about until the Persian age that began in 333 BC. During the Persian era we know the names of 8 governors of Judah including their several bullae, pottery handle stamps and coins! 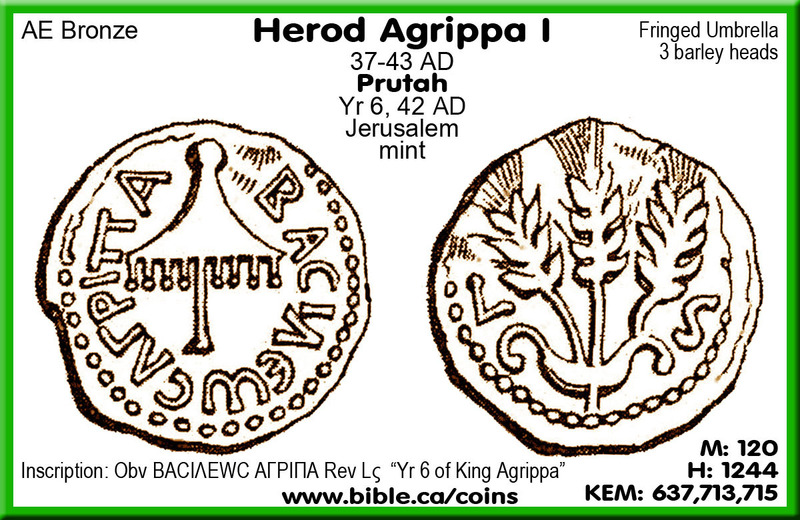 Made king in 37-41 AD, then both king and governor for 2 years after Marullus: 41-43 AD when Herod Agrippa I was eaten by worms in Acts 12. 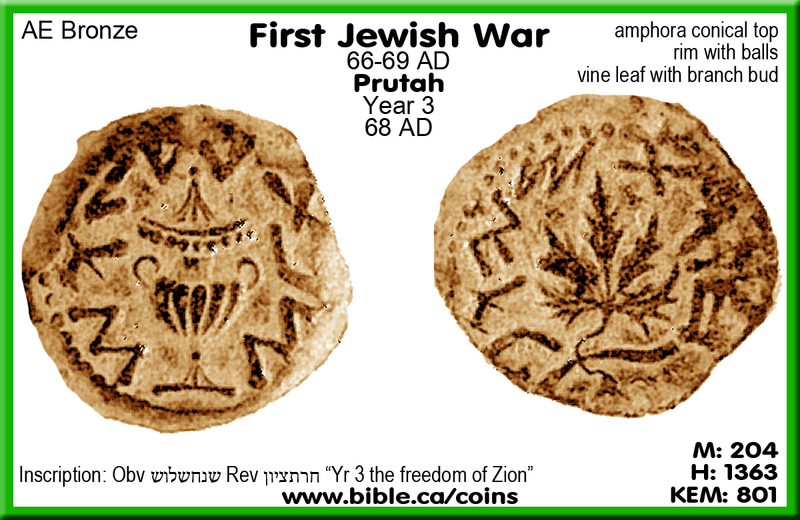 66-70 AD the first Jewish revolt broke out and thus ended the Governors of Judea. 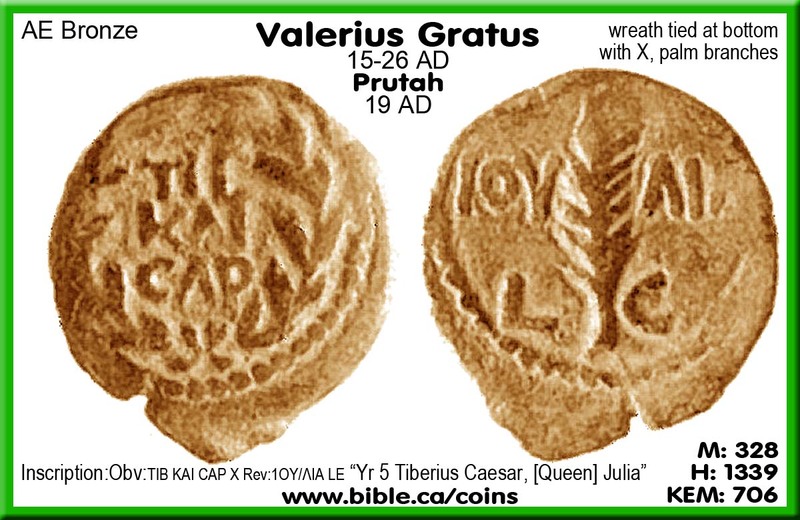 Jerusalem was destroyed by Titus in 70 AD ending the Jewish nation. 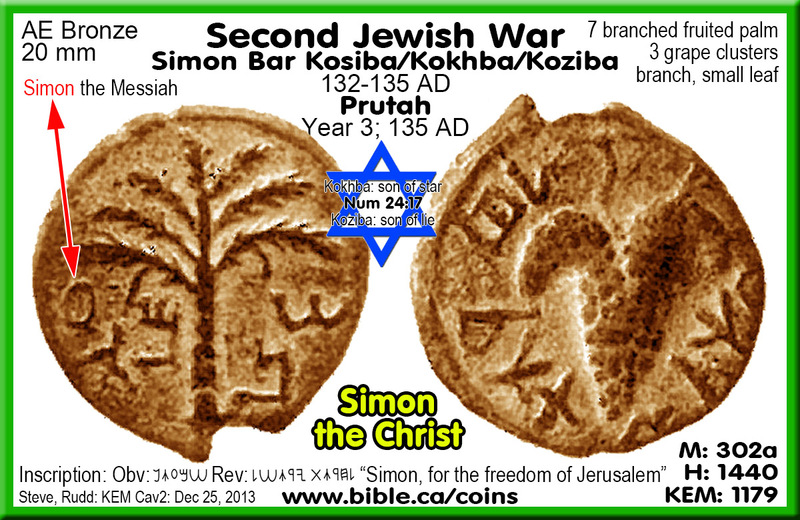 Simon bar Kokhba: Second Jewish war: 132-135 AD. 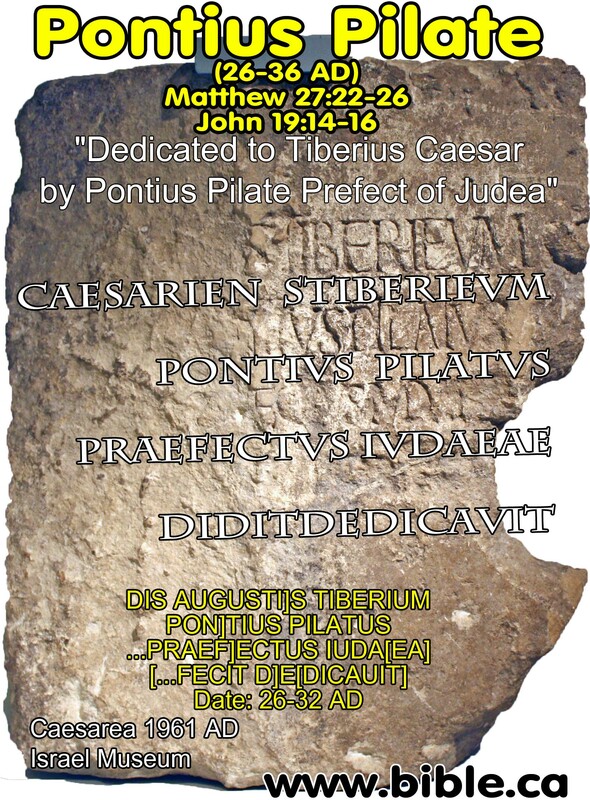 Hadrian 135 AD: Jews expelled from Judah, temple of Jupiter built on temple mount in Jerusalem, Judah renamed "Palestine" after the historic enemies of the Jews, the Philistines. 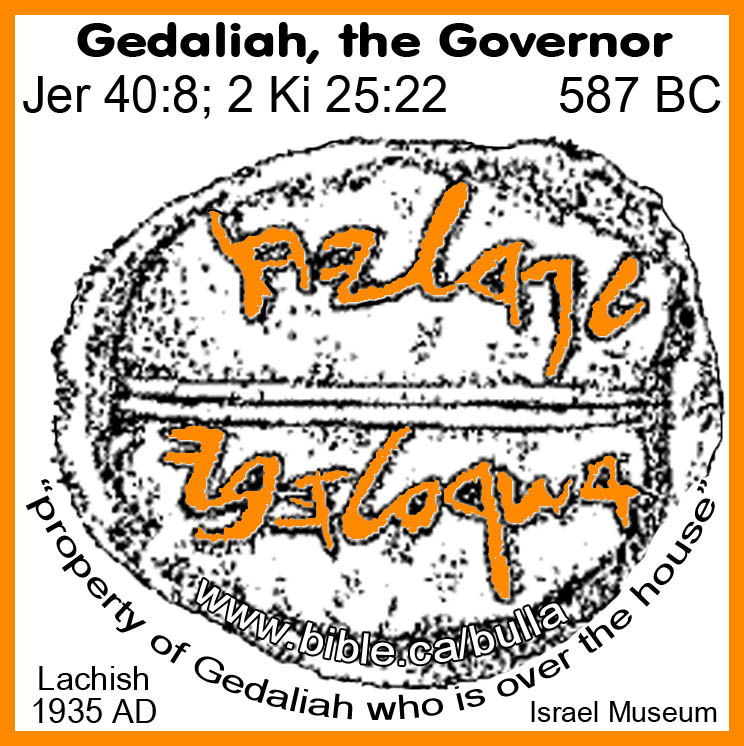 We have the bulla of Gedaliah, the governor whom Baalis assassinated through Ishmael. This stunning find at Lachish in the 1935 archeological season is a prize for Bible students. We have the bulla of Ishmael "the king's son" (of Solomon through Bathsheba), who was hired by Baalis to kill Gedaliah in Jer 41:1. Ishmael had disobeyed the prophet Jeremiah in surrendering to Nebuchadnezzar as Daniel had in 605 BC. He fled to Ammon likely around the same time and had lived with Baalis for 8 years. He was also a son of David and Bathsheba, who must have had intentions to take over as the new king of Judah in place of Gedaliah, who was not a son of David or of Royal descent. Add to this the fact that the Jews who left Ammon to be repatriated to Judah would have caused serious financial costs to Baalis. 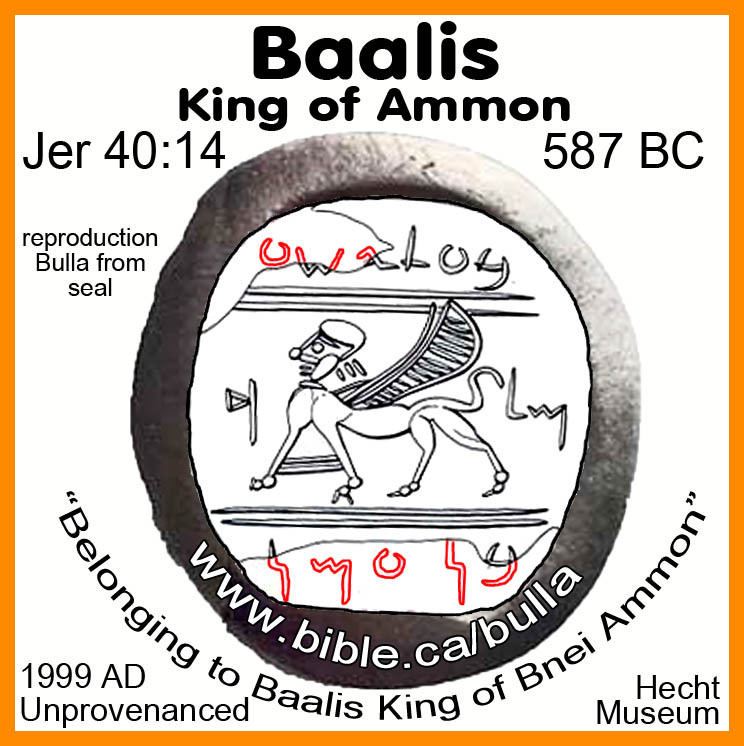 Baalis had likely made a deal with Ishmael that if he brought back the Jews who were living in Ammon that Baalis would support his bid to be king in place of Gedaliah. From the text is seems clear that Nethaniah was the direct father of Ishmael and that Elishama was the distant "father" whose name immediately connected Ishmael to the royal family. Elishama would be a known clan of the sons of David. Just as sons of Aaron formed three priestly clans, so to the sons of David formed separate well known clans. 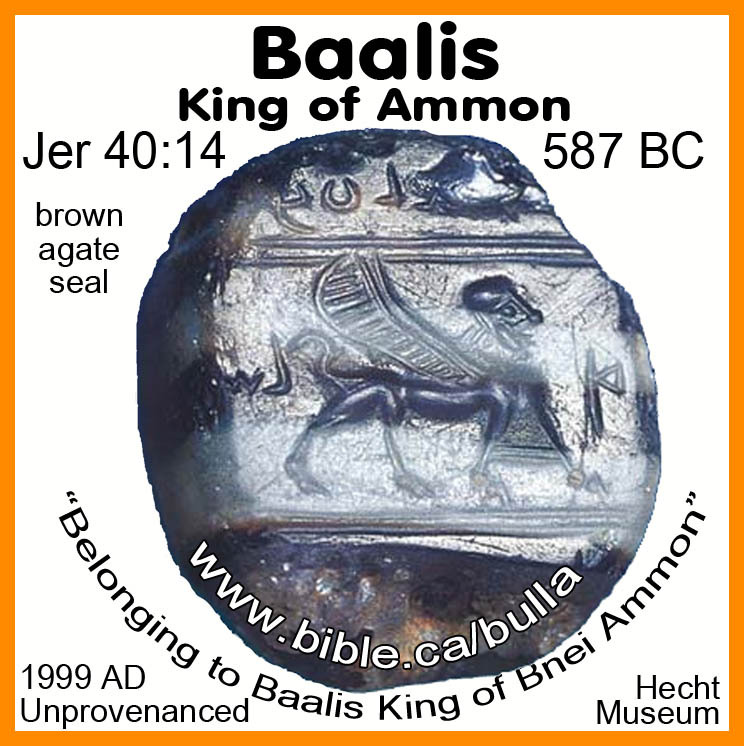 We have the seal of Baalis king of Ammon who hired Ishmael to assassinate Gedaliah in Jer 40:14. Notice that after Ishmael killed Gedaliah, that he was preparing to take the repatriated Jews who had been living in Ammon, back to Baalis! 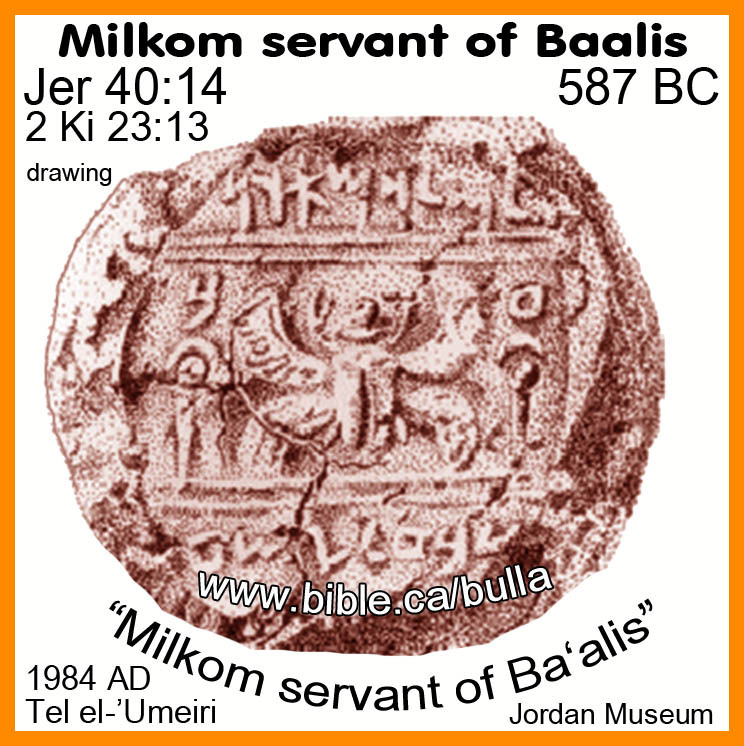 We have the Bulla of Milkom (Molech) servant of Baalis (Baal). It is likely that Milkon was part of the assassination plot against Gedaliah. He may have initiated it, planned it or help execute it. He certainly must have known about it given he lived at the same time. 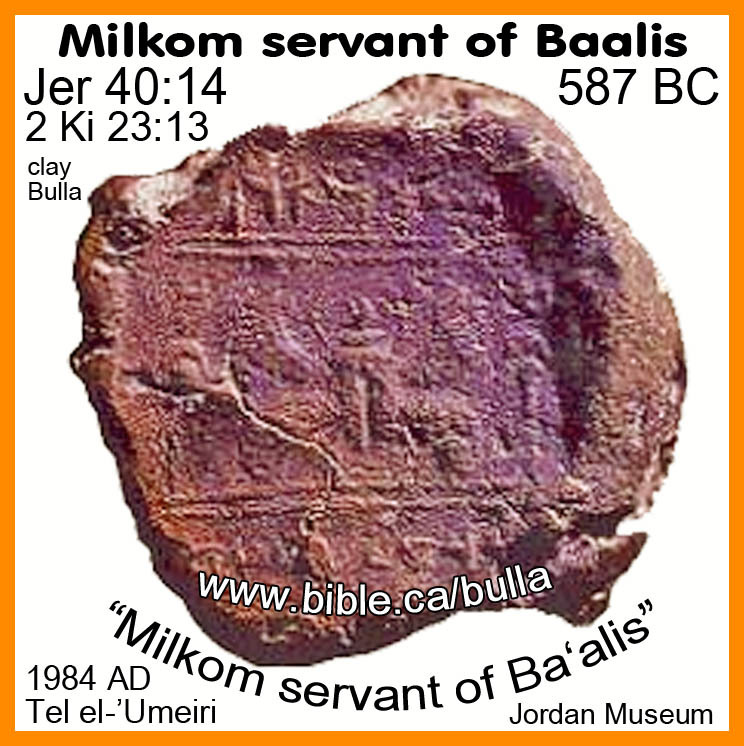 The importance of this bulla is not that Milkom himself is directly associated with the but that it is the second archeological source that confirms Ba'alis was in fact a real king of Ammon, contrary to the now silenced chortlings of Bible trashers who used the absence of evidence to say the Bible just made Baalis up like mother goose. 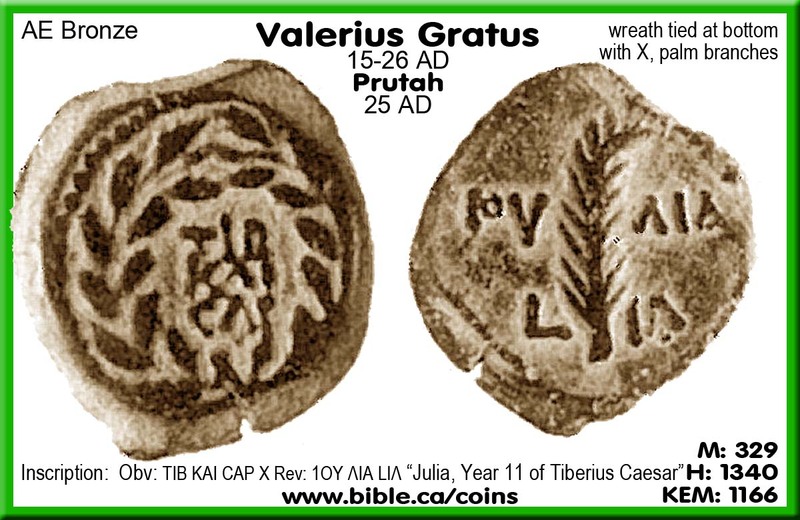 Both men's names on the bulla are of pagan gods: Milkom =Molech and Baalis =Baal. Although there is no man in the Bible named Milkom, it is another name for Molech, the idol god of the Ammonites. Just as Muslims name their fourth child, Muhammed-Muhammed-Muhammed-ABU-Muhammed, so too men would historically name their children after pagan gods. Here we have man named after the idol Molech who is the servant of Baalis who is named after the idol Baal. 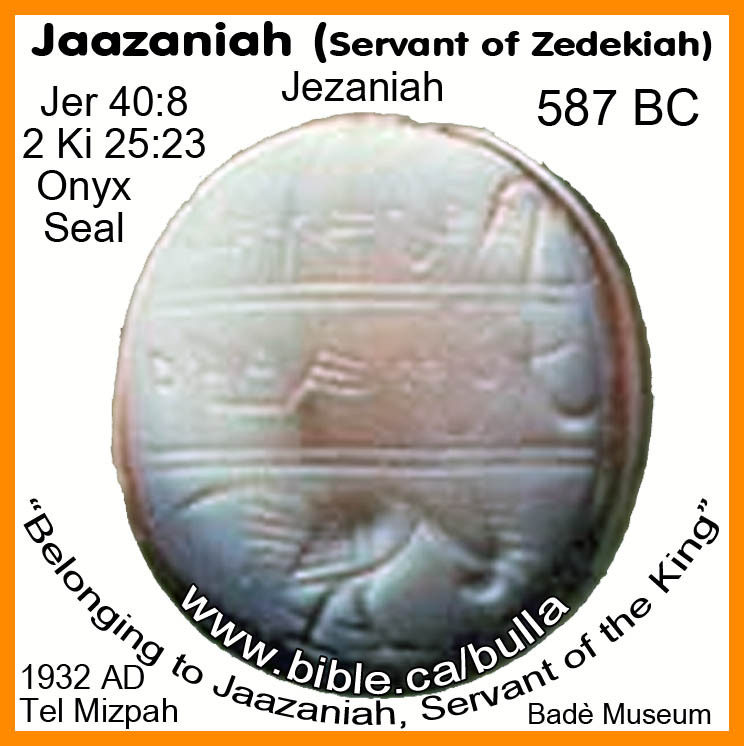 We have the seal of Jaazaniah servant of the king who helped assassinate Gedaliah. Jaananiah was hostile to Gedaliah and part of the assassination plot. 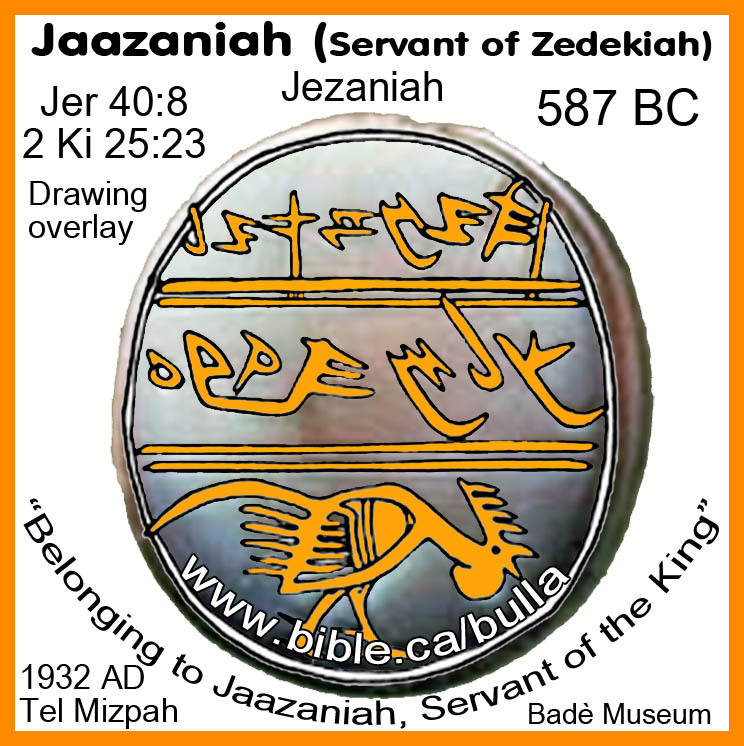 Therefore it makes perfect sense that Jaazaniah served king Zedekiah. 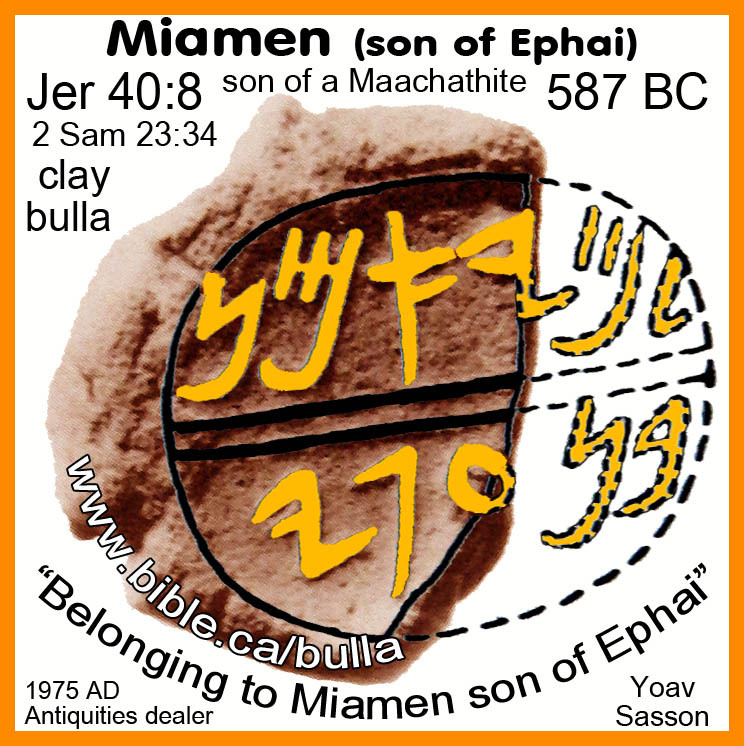 The Bulla of Miamen Son of Ephai, son of a Maachathite who helped assassinate Gedaliah. 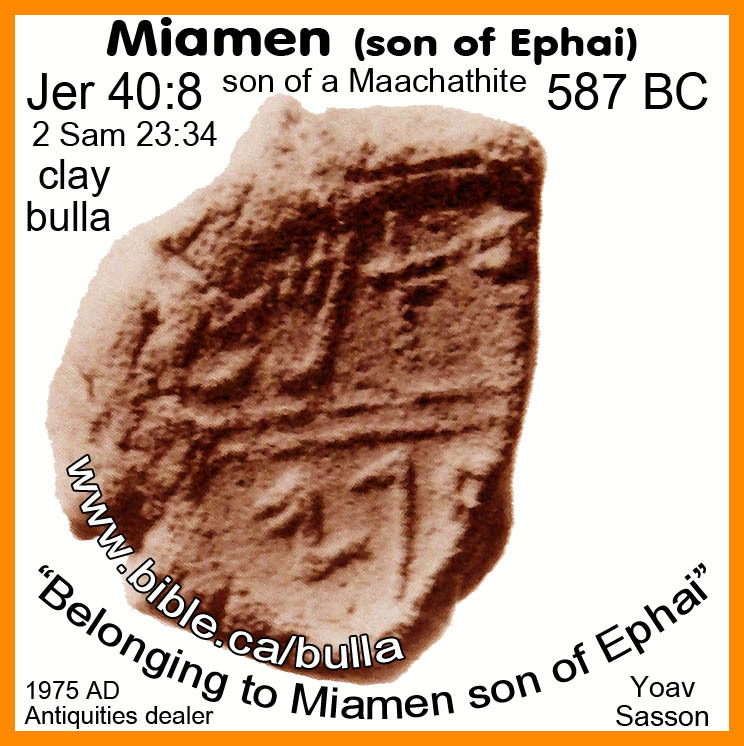 Miamen is not named in the Bible but the sons of Ephai were part of the assassination plot headed by Ishmael to kill Gedaliah. Gedaliah was the first in a long line of governors of Israel and Judah appointed by the four foreign powers: Babylon, Persia, Greece and Rome. 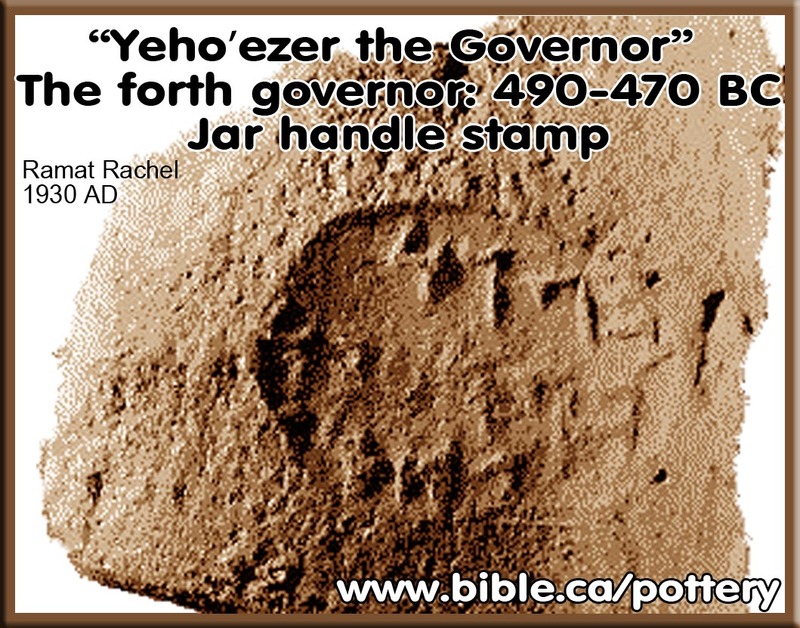 The Bible gives us little details about these governors but archeology has actually helped us fill in the gaps and the details. 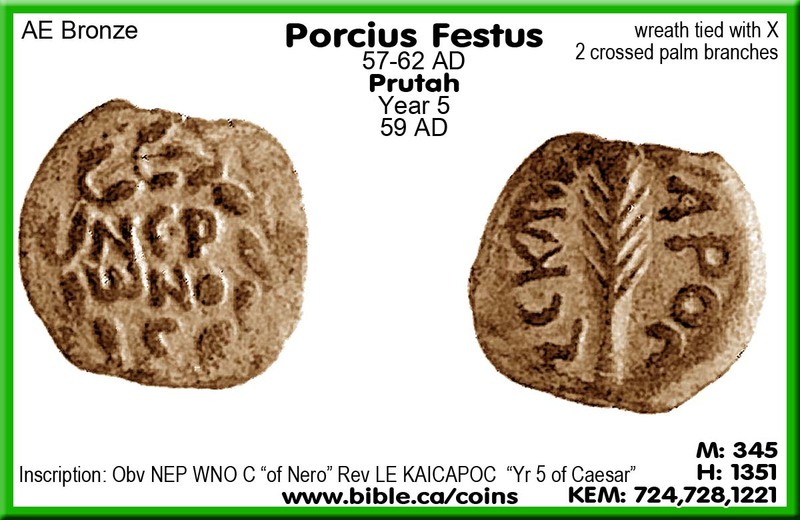 While the Bible is all sufficient for life and godliness and we have all we need for salvation in the revealed word of God, archeology certainly does add new information we would not know otherwise. This information is not needed since we have the Bible, but it sure thrills the heart of the Christian to learn about it! The Holy Spirit went to great lengths to specifically highlight direct parallels between the triumph of the House of David over the House of Saul in 1010 BC and the extinction of the house of David in 587 BC with the appointment of Gedaliah as the first in a long line of vassal kings that endured down to 70 AD. 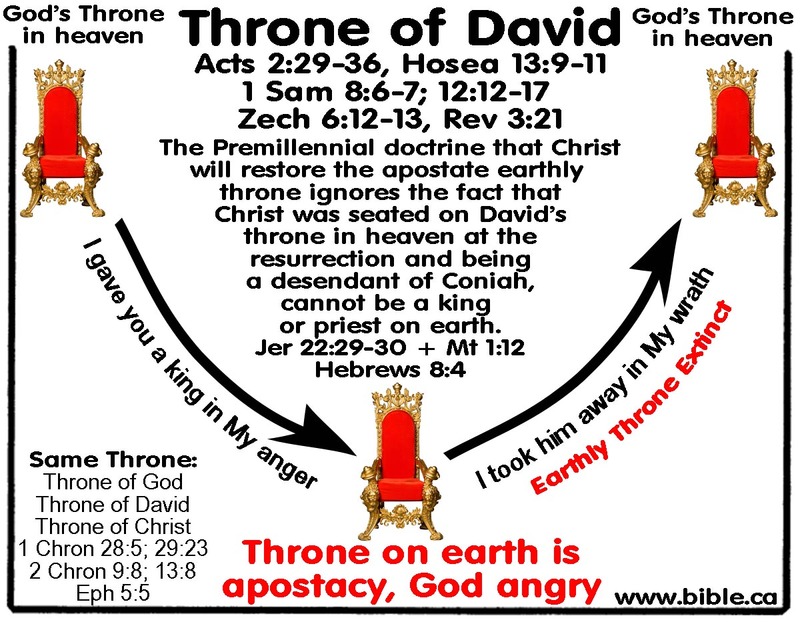 It is strange that Premillennialists reject that Jesus is a king sitting on the throne of David NOW in heaven, while wanting to restore an apostate earthly throne in Judah for a future time when Jesus can be king on earth. 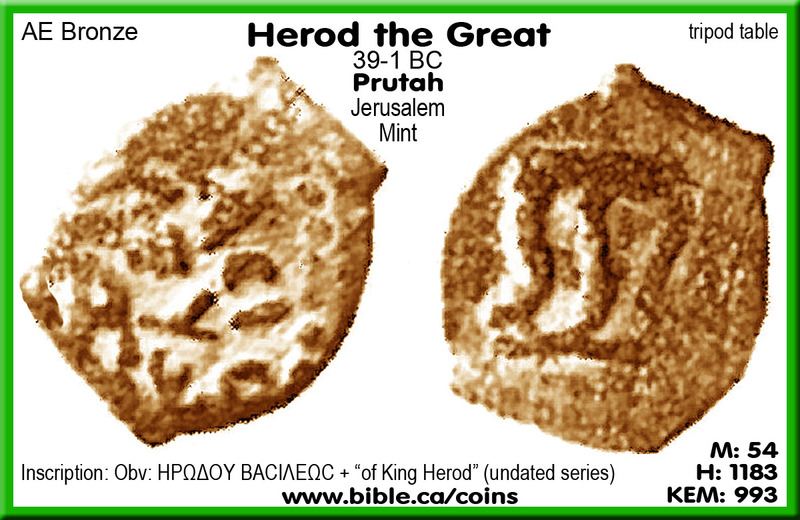 Jesus was a direct descendant of Jeconiah/Coniah: Matthew 1:12, therefore Jesus could never be a king on earth in Judah. Premillennialism, therefore, fails to understand that the fact that an earthly throne never was God's will and he allowed Saul to replace Him as king only after a series of natural disasters impressed how angry God was in their asking for an earthly throne in the first place. God gave appointed Saul in his anger and made extinct, the earthly throne in 587 BC in his wrath. The throne of God from all eternity was in heaven. Then from the time of Saul to the time of Zedekiah God allowed the "Throne of God" to come down to earth. In 587 BC the throne of God was restored in God's wrath, ever again to be on earth. 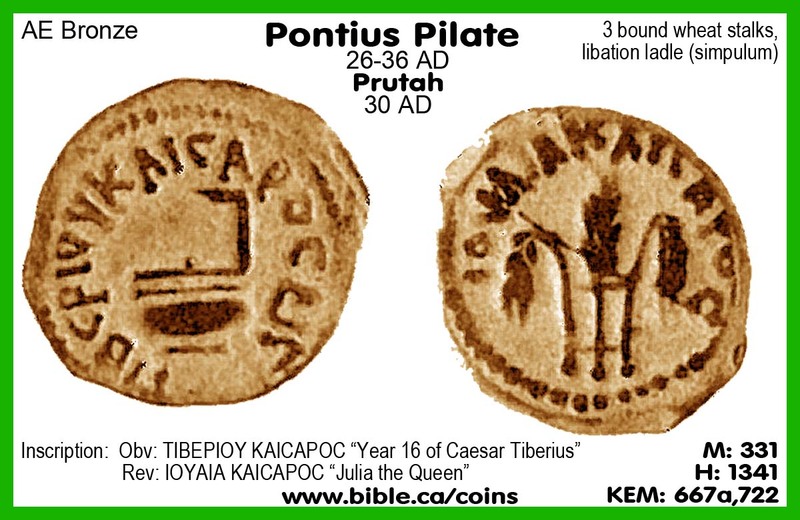 Jesus Christ was seated on the throne of David IN HEAVEN at his resurrection: Acts 2:29-36. Three times God calls Nebuchadnezzar "My Servant" (Jeremiah 25:9; 27:6; 43:10) and the appointment of Gedaliah was directly from God's will. In the same way Titus was the "Servant of YHWH" when the Romans destroyed Jerusalem in 70 AD. The Jews didn't like the idea of being bossed around by the Babylon king Nebuchadnezzar and they killed Gedaliah just like they killed the other righteous prophets of YHWH. Jesus Christ was the God appointed king of Israel whom they nailed to the cross. The murder of Gedaliah was the final act of disobedience and ended the kingdom of Judah forever! Had they listened to Jeremiah, Jerusalem would not have been destroyed by the Babylonians on the 10 Av 587 BC. Had they listened to Jesus, Jerusalem would not have been destroyed by the Romans on the 10 Av 70 AD. God sent a clear message in twice destroying Jerusalem on the exact same day of the year, 656 years apart. 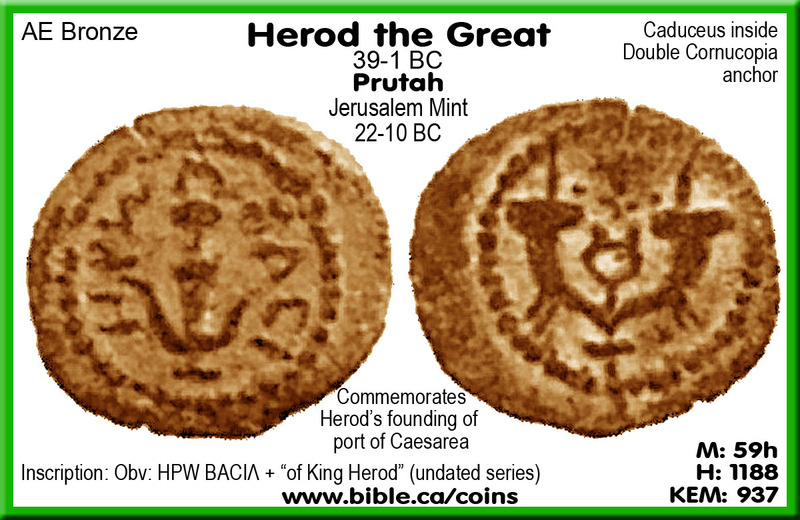 In the story of the assassination of Gedaliah we have 6 bulla and seals in two Bible texts, from men directly involved in this tragic story. First time Jeremiah commanded all to surrender to Nebuchadnezzar and be deported to Babylon or die. The disobedience hid in the fields, fled to foreign countries then surfaced after the Babylonians returned home thinking they were so smart to have NOT listened to Jeremiah. This same group then asked Jeremiah to pray for guidance and command from God for direction. Second time Jeremiah commanded them to NOT surrender to the Egyptians but to remain in Judah. They all ended up dying in exile in Egypt under the hands of Nebuchadnezzar in 582 BC just as Jeremiah had predicted. It seems God creates circumstances that only those who walk by faith can successfully navigate without harm. Those who did not obey God and surrender fled to Ammon or hid themselves in bunkers in the hills. 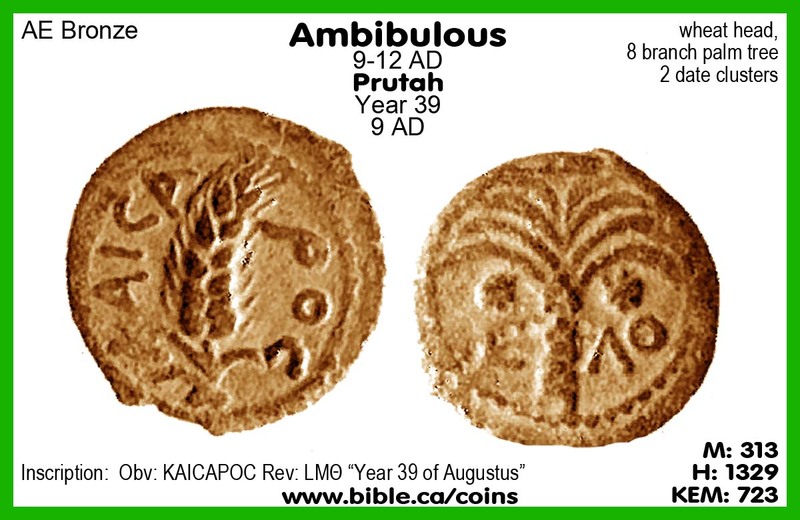 When these returned, they were cursed because the very lack of faith that caused them to disobey Jeremiah's original order to surrender, led them to disobey Jeremiah's second order to NOT flee to Egypt but stay in Judah. Ishmael had a right to claim the throne of David but was not chosen by God to do so. His murder of Ishmael shows his black heart was only interested in self-preservation and power as a king. Johanan the son of Kareah was Zedekiah's failed army general and a coward who chose to hide from the Babylonians rather than fight in the same way Captain Francesco Schettino abandoned 300 passengers aboard the sinking Costa Concordia in 2012 AD. He came out of hiding and made himself look like a hero by warning Gedaliah of his impending death then repelling Ishmael back to Ammon and rescuing the captured daughters of the king destined to be sold as slaves to Baalis. But in the end he was also a black heart to lead the people to death in Egypt. The assassination of Gedaliah is a story of success of a tiny faithful remnant. Those who surrendered to Babylon never had to experience the horrific and terrifying destruction of the city or the witness the injustice of the murder of Gedaliah. When the Jews in Babylon did hear about the murder, they enacted a feast on the 7th month (Zechariah 7:3; 8:19) but today the fast is held on the 3rd of Tishri. It is a strange paradox that the Jews have been keeping a memorial feast day for the innocent slaughter of Gedaliah at the hands of his fellow Jews and they refuse to even acknowledge an even greater injustice in the crucifixion of the innocent, sinless the son of David, rightful heir to the throne of David, Jesus Christ. The faithful obeyed Jeremiah and lost all their worldly possessions but gained their "life as a booty". In the same way Jesus Christ calls upon us to surrender voluntarily to him, give up all our worldly possessions, pick up our cross and follow him in order to gain "eternal life" as our booty! Will you volunteer to surrender your life to Jesus who rose from the dead? Will you call God a liar when he says Jesus rose from the dead?